TOTAL CONTROL - Designed for short stems and wide handlebars to maximize control in rough terrain. CONFIDENT HANDLING - Slack 68° head angle creates the stable, confident handling you need to rule the descents. SHORT AND STIFF - Short chainstays give the Trail an agile, nimble feel and provide great traction on steep climbs. KILLER SPEC - With Shimano hydraulic brakes throughout, reliable 2x drivetrains, great tyres and wheels, Trails are ready to rock. RIGHT-SIZED WHEELS - Trail bikes are designed with 27.5” on the smallest size and 29” wheels for the larger sizes to offer the best possible blend of fit, fast and fun for all riders. 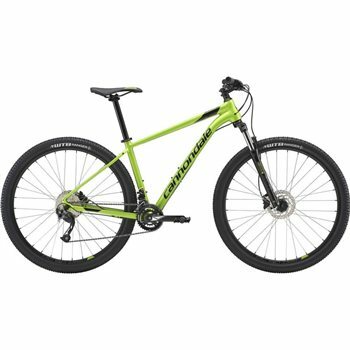 RIDER PROFILE - Active or aspiring mountain bikers looking for an affordable upgrade or a first bike that’s a cut above. RIDER POSITION - Fast Trail Geometry - Semi upright body position strikes a great balance between comfort and performance. Fork: SR Suntour XCM-HLO-DS, 100mm, 1-1/8", coil spring. Rims: Cannondale DC 5.0, double wall, 32-hole. Hubs: Formula DC1420 front, Custom BOOST QR Formula rear. Crank: FSA Alpha Drive, forged, 22/36. Bottom Bracket: Tange LN 3912, square taper. Front Derailleur: MicroShift Direct Mount. Rear Derailleur: Shimano Altus 9-speed. Shifters: Shimano EZ Fire 505, 2x9-speed. Handlebar: Cannondale C4, 6061 Alloy, 20mm rise, 680mm.